I just finished watching NOVA The Elegant Universe”. I love that stuff. Although I cannot understand the equations it is fascinating to think about “who lives in these other dimensions?” Do they exist? If they do, how can we prove that by experiment? The theory of everything may exist right now. We just can’t truly understand it in a real world comparison or model. Pretty cool stuff. It was great letting the llamas into their new pasture. I found it to be a bigger relief than I expected. Things bug us all. We are masters at suppression. The small llama environment bugged me. It has been fun watching them test their new environment. Professor the Alpha seems to have a harder time than the others. He has been confused of how to get into the new pasture when he sees his buddies there. One of the great things about having animals is using them as a model for understanding human behaviors. I think it also the same thing as "Farm sense". Aries posed for me. Can you see his vitality? I think he grew two inches with the new pasture. We are planning a bon fire this weekend. I have a spot out in the middle of a 40 acre pasture that I am going to torch. I am calling the fire department to make sure they have started the brush truck recently and that it has gas in it. I plan on moving parts of some old buildings to the piles of junk, brush and trees. It will be safe and amusing. A good time to be an inane simple thrill seeker. I am getting there with the fence. I still have to tweak it, but I am getting there. It has been well into the 90s here today. We have to pace ourselves and I took a long siesta with the fan going. I am not sure how the folks in Florida deal with this all the time. 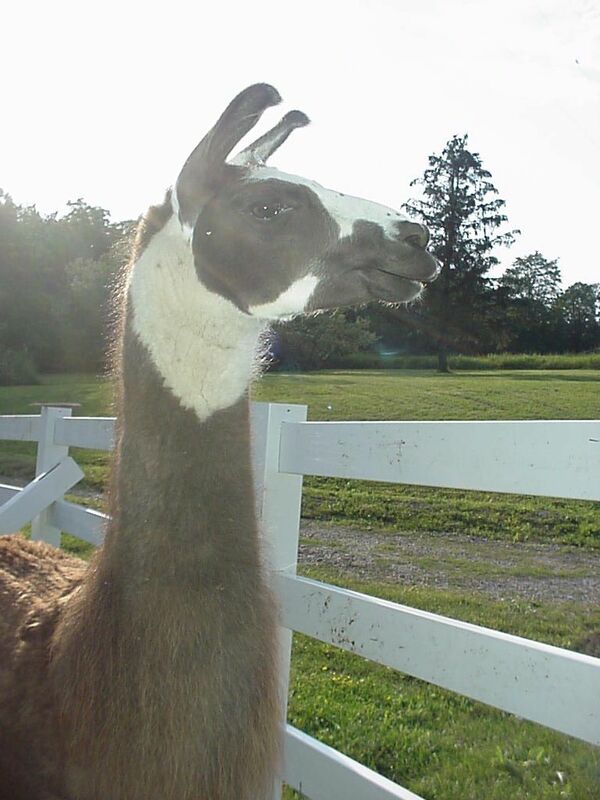 I am going to go rig up some temporary gates and let the llamas out. "Chuka Chuka. Who let the llamas out?" Well maybe not the ideal lyric. I am gaining on the fence. These pics were taken Saturday. You can see the llama house is moved and the holes are done. I rented a 35 pound demolition hammer to clear out what I thought was shale in the ones I couldn’t get the auger through. In a few I did find however some concrete slab from the old house. That made the job go a little slower since I was cutting through 8 inches of concrete with the small hammer. I would have rented a 60 pound jack hammer if I had known. I am taking Monday off. I will have it ready for animals on Monday I hope. Some tweaks will be left and the gates to make, but the animals will have more room. I stopped over at the Labar's the other night to take some pics of some horses (hor-sees’). This little guy is about 4 days old.